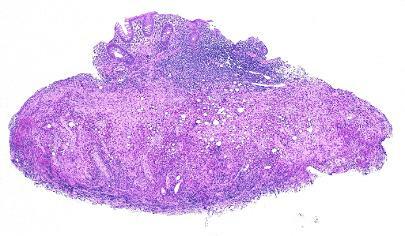 46 year old male with a family history of colorectal carcinoma and a personal history of rectal hyperplastic polyps. A 3mm polyp was detected in the ascending colon. Polypoid Langerhans cell histiocytosis of the colon. 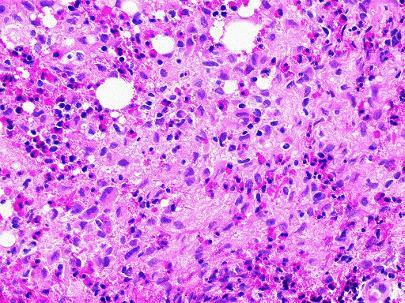 Langerhans cell histiocytosis (LCH) is a rare, neoplastic histiocytic proliferation of unknown aetiology. Its clinical presentation ranges from asymptomatic unifocal (single organ) disease to potentially lethal multifocal, multisystem disease. Isolated gastrointestinal tract involvement by LCH is extremely rare and, in contrast with the usual presentation in LCH, predominantly occurs in older females. Most of the reported cases to date have involved the colon but it can also be seen in the stomach or small intestine. It is usually identified in asymptomatic individuals undergoing screening colonoscopy but it can present with non-specific abdominal symptoms. The polyps tend to be small (1-8mm) and solitary. The histologic findings in polypoid colonic LCH are identical to LCH elsewhere within the body. The polyps contain collections of large cells with eosinophilic cytoplasm and oval to reniform nuclei with nuclear grooves. The lesional cells are surrounded by a mixed inflammatory cell infiltrate composed predominantly of eosinophils and lymphocytes. 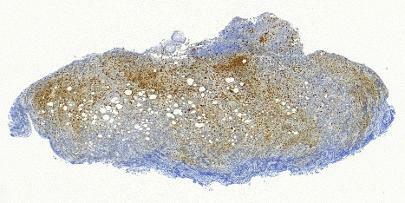 Immunohistochemistry shows the cells are positive for S100, CD1a and Langerin. 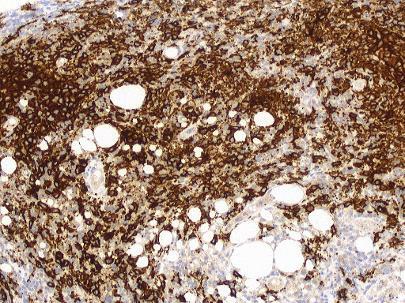 There is variable staining with CD68. Recently, BRAF c.1799T>A (p.Val600Glu) mutations have been identified in 30-60% of cases of LCH. A mutation in MEK (a downstream protein in the MAPK pathway) can be identified in a further 27% of cases. It is thought that high risk (multifocal, multisystem disease) LCH arises from somatic mutation of a haematopoietic progenitor, whereas low-risk disease, such as seen in this case, arises from somatic mutation of tissue-restricted precursor dendritic cells. Solitary lesions of LCH in the colon are generally thought to be indolent however in the largest case series in adults (10 patients) 2 patients developed skin recurrence up to 2 years following the diagnosis. As the absolute risk is unknown, close colonoscopic monitoring is probably warranted. Singhi AD, Montgomery EA. 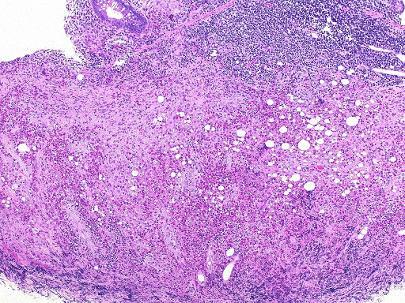 Gastrointestinal Langerhans cell histiocytosis: A clinicopathologic study of 12 patients. Am J Surg Pathol 2011;35:305–310. EL Demellawy D, Young JL, De Nanassy J, etal. Langerhans cell histiocytosis: a comprehensive review. Pathology 2015;47:294-301.